Welsh indie popster Los Campesinos! have been a reliable source of hooked-filled toe-tappers for several albums now. 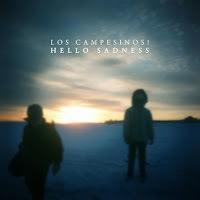 On November 15th they return with their latest installment Hello Sadness. At first it seems as though this is a typical Los Campesinos! record. It has the energy and a strong pop sensibility that we've come to expect from the band. After prolonged exposure however, it's clear that this is a much darker album. Los Campesinos! lyrics have always had a sinister aspect to them. This time around though, there is even more poison on the tongue. Or maybe it just seems that way since the music is more methodical and ominous. A heavier bottom end drags "Song About Your Girlfriend Along". Guitars squeal to bring the title track to a halt. The most interesting new development is the aggressive back-and-forth vocal delivery during "Every Defeat a Divorce (Three Lions)". The down tempo numbers do act as an anchor on the record through. Without the energy tracks like "To Tundra", "Life Is a Long Time", and "Light Leaves, Dark Sees Pt II" don't have enough layers to hold the listener's interest. Never fear though, Los Campesinos! do come through with a number of highly-infectious pop ditties. Solid hooks, melodies, and call-and-response vocals will have songs like "By Your Hand" and the methed-up frenzy "The Black Bird, The Dark Slope" worming their way into your brain. There have been more memorable and gripping Los Campesinos! albums. Hello Sadness though, is the sound of a band at a crossroads. They could have chosen to continue along their well-trodden path and stagnate, or they could try to expand on their repertoire. They chose the latter and should be applauded for the effort, even if every move wasn't necessarily the right one.